Comprehensive review of Glow by Dr. Brandt Overnight Resurfacing Face Serum. See how this retinol cream compares against other wrinkle creams! Overall I feel as if Glow by Dr. Brandt is a pretty good retinol product. It’s without a doubt above average. However, I still feel there’s room for improvement! I love how this product clears my skin up and relieves acne. However, when it came to reducing lines and wrinkles (which is what it’s marketed to do) it seemed to fall slightly short. It did make my skin smoother and my makeup went on better, however my lines are still noticeable. Even though this product contains 2% retinol, it never irritated my skin which I love. I even used this serum every night and never experienced any adverse effects. I feel, especially for the price, it could have been more potent. However, I was still pleased with my skin. I really love using a retinol product that’s strong and targets my lines and this product wasn’t quite there, however for sensitive skin or someone newer to using retinol products I recommend trying it! Glow by Dr. Brandt Overnight Resurfacing Face Serum is a lotion type serum. It’s very creamy and has a white pigment to it, however it’s still very lightweight. Applying Glow is really simple. Now, the bottle recommends that you only use this serum 3 times per week. However, I used it every night! This serum dries really quickly. Although it has the appearance of a lotion, it’s never sticky and you can never feel it on your face. The smell of this one is neither here nor there. It’s not my favorite scent, but it’s also not offensive. It has a bitter, lemon, almost medical odor to it. However, the smell dissipates really quickly. Waking up the next morning after using Glow, I really loved what I saw. I was fighting a really bad breakout on my forehead when I started using this serum. Nothing I used seemed to help clear my skin up, and after one use, my acne calmed down and I could tell that it was going to agree with my skin. Longer term I noticed some changes to my skin after using Glow by Dr. Brandt Overnight Resurfacing Face Serum. The biggest change that I noticed was how much it improved my acne. Once I started using this serum, it immediately calmed my breakout and within 3 days my skin was back to normal. That was the biggest positive change that I experienced. My skin looked very healthy while using this product. However, I didn’t notice that much of a change to my lines and wrinkles. My skin did look really smooth and had a glow about it. I was happy with the changes I noticed. However, I was hoping to see a more dramatic effect to my lines. Glow by Dr. Brandt contains pure retinol, which is a good thing. It contains 2% as well, which makes it slightly stronger than some other over the counter products out there. It also contains maslinic acid. Maslinic acid is known for calming skin inflammation and reducing redness. Shea butter is another key ingredient. Shea butter has been used for years in order to help protect, renew and hydrate skin. 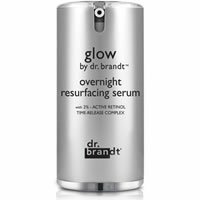 A 1.7 ounce tube of Glow by Dr. Brandt Overnight Resurfacing Face Serum costs $85.00. Now that may appear to be slightly more expensive than other products out there, however you are getting more, since most serums come in a one ounce container. This price works out to be $50.00 per ounce. That’s still expensive, but it could be worse! Dr. Brandt offers a 30 day money back guarantee, which is nice! To buy Glow by Dr. Brandt Overnight Resurfacing Face Serum, click here. Texture/Feel It’s very creamy and has a white pigment to it; however, it’s still very lightweight. Application After you cleanse your skin at night, you apply a thin layer all over your face. Smell It has a bitter, lemon, almost medical odor to it. Short Term Results My acne calmed down and I could tell that it was going to agree with my skin. Long Term Results The biggest change that I noticed was how much it improved my acne. Guarantee Yes, Dr. Brandt offers a 30 day money back guarantee. Price It’s $85 for 1.7 oz. Expensive, but could be worse.